Contrary to the Mapungubwe region as a whole, the accommodation in the Mapungubwe National Park has deliberately been kept to a minimum to ensure minimum impact on the environment. As a result you will find a wide variety of accommodation establishments in the region surrounding the Park, catering especially for the Park’s visitors. Find out all about accommodation in and around the Mapungubwe National Park by clicking on any of the subjects in the menu below. Located in the eastern section of the Mapungubwe National Park, Leokwe, the main rest camp of the Park, nestles against a spectacular backdrop of sandstone hills and rocks. With the theme of its design based on the rich history of the area, the Leokwe rest camp radiates the peaceful atmosphere of a typical Venda village. There are around 18 thatched cottages, each with a good deal of privacy and beautifully furnished and decorated. Each 2-bed cottage has an open-plan kitchen, 1 bedroom with 2 single beds, Double sleeper couch (not suitable for adults), aircon, Ceiling fan, Wc and shower and Barbecue facilities. Two of the 2-bed cottages are equipped with a shower and toilet for physically disabled persons. Each 4-bed cottage has an open-plan kitchen, 2 bedrooms - each one with 2 single beds, Aircon, Ceiling fan, Wc, Shower and Barbecue facilities. 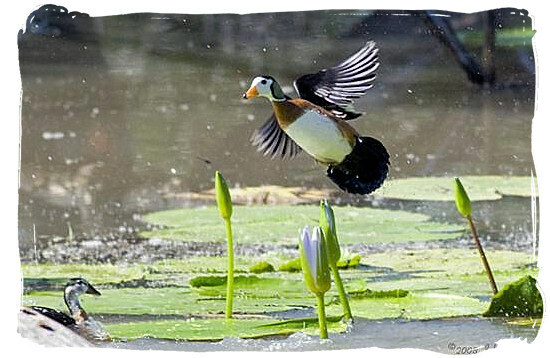 The camp is very close to the Maloutswa pan game hide, which is good for game viewing. CLICK HERE... to find out more about tariffs and availability. Situated in the beautiful riverine forest of the Limpopo river in the western section of the Park, spread out under giant Nyala trees, lies the Limpopo Forest Tented Camp. 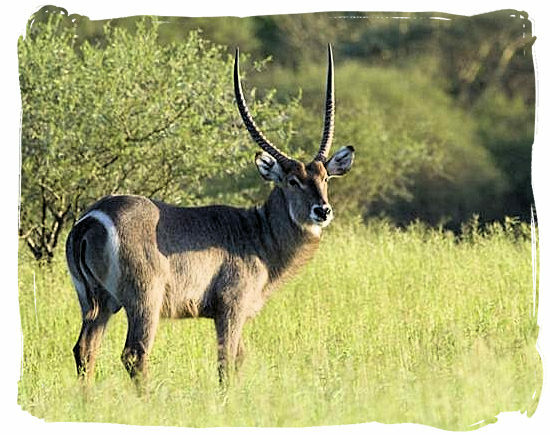 Around the unfenced accommodation at the camp you can look out for Elephant, Giraffe, Kudu, Waterbuck, Bushbuck, Impala, Warthog, Duiker and on the nearby plains Jackal, Zebra, Blue Wildebeest and more. The lucky ones may see predators like lions, leopards and hyenas. The accommodation at Limpopo Forest Tented Camp consists of 8 self-catering safari tents and is accessible with normal sedan vehicles. Elegantly designed and spacious, each one of these luxury tented units is equipped with a bedroom with 2 single beds, Ceiling Fan, Kitchen, Wc and shower and Barbeque Facilities. One of the 2-bed safari tents is equipped with a shower and toilet for physically disabled persons. There is a fenced swimming pool. 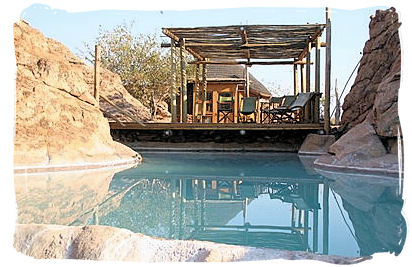 Nestling on a small ridge on the perimeter of the lush Mapungubwe valley in the eastern section of the Park, lies Vhembe Wilderness camp, within walking distance of the Limpopo river and Mapungubwe Hill. This camp has 4 comfortable cabins, each with its own small deck overlooking the picturesque valley. There is a communal boma where guests can sit around the fire to unwind and recollect their experiences for the day. 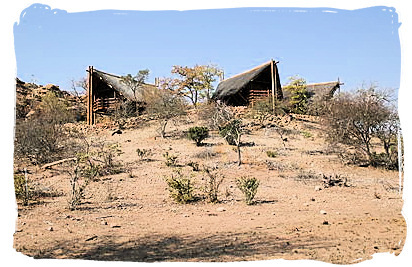 The accommodation at Vhembe Wilderness Camp comprises 4x 2-bed A-frame cabins built of a combination of wood, canvas and thatch. 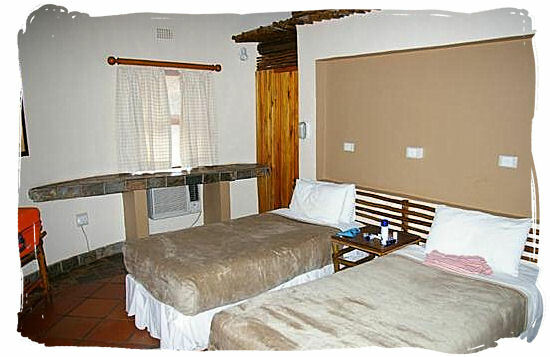 Each one is equipped with 2x single beds, en-suite bathroom (WC and shower). 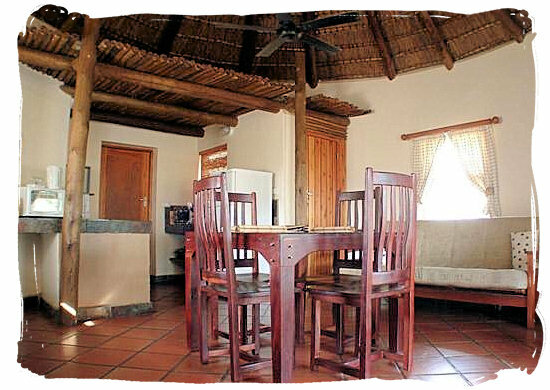 The four units share a central, fully equipped communal kitchen and boma. Located in a beautiful spot in the riverine forest of the Limpopo about 1km from the Limpopo Forest Tented camp, lies the brand new Mazhou camping site. Like the other camps Mazhou is unfenced. The camp site itself is lovely and offers camping sites for 10 caravans or tents. Each camping site is numbered, clearly demarcated and has its own tap, power point, dustbin and light. The camp sites are all very well shaded. For the luxury minded there is Tshugulu lodge. Set against the backdrop of a large sandstone formation, the Lodge is situated in a region where members of the “Big Five” like to roam, so unguided walking is not permitted. Guests have exclusive access to a 40km eco-trail, suitable only for four-wheel drive vehicles. Tshugulu Lodge sleeps 14 people and must be booked completely by a single group, witch is ideal for intimate groups of people. Accommodation at Tshugulu Lodge provides fourteen beds in seven bedrooms cooled by air-conditioning. Five in the main building and two bedrooms with their own kitchenette in a small chalet a short distance away. Perfect for those who value a little more privacy. The main building has a well equipped kitchen, an open veranda and an air-conditioned lounge. The lodge also offers a offers a refreshing swimming pool for those that want to cool off. 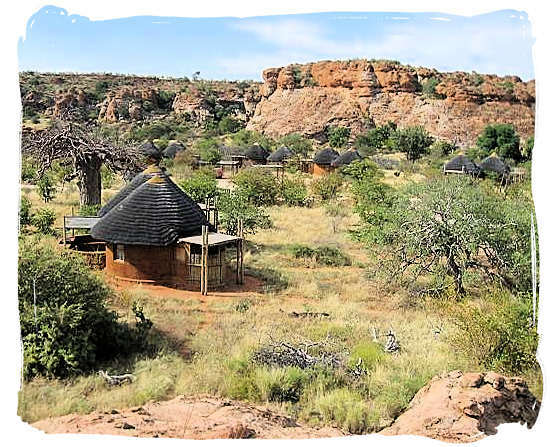 In the Mapungubwe region outside the Mapungubwe National Park you will find a wide variety of accommodation establishments, catering especially for the Park’s visitors. CLICK HERE... to find out more about choice, tariffs and availability.